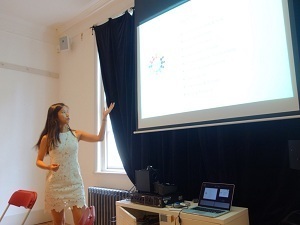 In summer 2015, I had the opportunity to work as an IT Communications intern at the Oxfordshire Social Entrepreneurship Partnership (OSEP) at Oxford, United Kingdom. Not only did I have the opportunity to take my education in IT Management into practice, but I also made meaningful personal relationships that will last well beyond the summer. Immersing in the Oxford community through my work at OSEP was truly a once-in-a-life-time experience, and I am thankful for the Nanovic Institute for European Studies and the Vill Family Endowment for Excellence for making the opportunity possible. I met Mr. Jeff Willmore at the Ashoka U Exchange, a conference on social entrepreneurship education, in Washington D.C. in February 2015. As the Social Entrepreneurship Program Coordinator at the Oxford Brookes University, Jeff shared with me an initiative that he was leading—Oxford Social Entrepreneurship Partnership (OSEP). OSEP is an initiative managed and operated jointly by Oxford Brookes University, University of Oxford—including the world-renowned Skoll Center for Social Entrepreneurship—and Student Hubs. Founded in fall of 2014, OSEP aims to act as the best and most comprehensive network of support and funding, or a “one stop shop,” for social entrepreneurs in the U.K.. I was intrigued by Jeff’s efforts creating synergy among social entrepreneurs in the Oxford community—something that I had been longing to do in the Notre Dame community. The Vill Family Endowment for Excellence as part of the Nanovic Institute for European Studies supported my pursuit to work as an intern for OSEP while learning about efforts related to social entrepreneurship at Oxford. As an intern, I worked on OSEP’s new initiative of building an online map of social enterprises in the Oxfordshire area. My work mainly entailed online research, interviews, web management, and database development. There are about 250 social enterprises in the area and my task was to consolidate information of these social enterprises and input the information into an online database. Aimed at fostering a connected community, the online map provides a visual guidance for social entrepreneurs who are interested in collaboration with local social enterprises or people who are simply interested in learning about local initiatives. The filtering feature also allows users to efficiently identify organizations of their interests. In addition to researching information of the social enterprise and putting them to the online map, I took the initiative of interviewing people involved in local social enterprises to add a qualitative dimension to the project. My interviews resulted in reports that will be ready to be published once the website launches the blog section. By having conversations with people involved with social enterprises in Oxford, I was both able to both build meaningful personal relationships and become engaged in the community of social entrepreneurs. At the end of my internship, I was able to add 35 social enterprises to the map and interview founders and employees of three organizations, enabling a robust foundation for the project going forward. Aside from my internship, I took advantage of my free time at Oxford by attending two conferences on topics of my interests: Advancing Good Governance hosted by the University of Oxford and the SEE Change Conference hosted by UnLtd in London. The two conferences offered tremendous learning opportunities and connected me to interesting people. Furthermore, my interest in entrepreneurship education had also led me to meet up with several educators at the University of Oxford to discuss successful practices in inspiring and educating young entrepreneurs. My engagement in Oxford has left an indelible mark on my academic, personal, and professional development. Taking my training of IT Management into practice by delivering useful results to an organization that I admire was both fulfilling and effective in developing my professional expertise. Connecting with local people and engaging in the community stretched my worldview and left me with long-lasting relationships that I will always treasure. 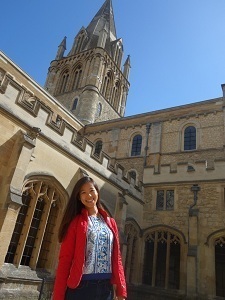 My experience also reinforced my interests in pursuing a graduate degree at Oxford in the future. 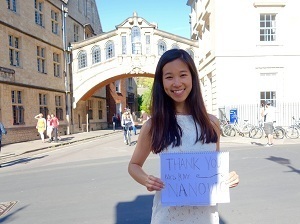 I am deeply thankful for the Vill Family Endowment for Excellence and the Nanovic Institute for European Studies for making my experience in Oxford possible. Originally published by Jen Fulton at nanovic.nd.edu on November 24, 2015.